Earlier this week, Creative Assembly released a new reveal trailer for Total War: Three Kingdoms; one which revealed that Dong Zhuo would be the game’s twelfth playable faction leader. The trailer gave players a glimpse of the ruthless tyrant in-game, along with his adopted son; the fearsome warrior Lu Bu. Now, in a similar manner to that of the ‘A Hero’s Journey‘ trailer, Creative Assembly has made the music featured in the new trailer from the Total War: Three Kingdoms soundtrack free to download. The first trailer which Creative Assembly released in 2019, ‘A Hero’s Journey,’ was followed by the studio releasing the trailer music as a free download; the first time they have done so for music taken from the Total War: Three Kingdoms soundtrack. Creative Assembly have released free music before, but not for this game; they released the Tattered Sails Shanty from the Curse of the Vampire Coast DLC trailer in late 2018, for example. To get that track, and the new music from Dong Zhuo’s reveal trailer, you simply need to download it from Total War Access. This is a very simple process. If you don’t already have a Total War Access account, then you’ll need to create one. This is a totally free service, and merely serves as a place for Creative Assembly to release free content like wallpapers, posters and music downloads. 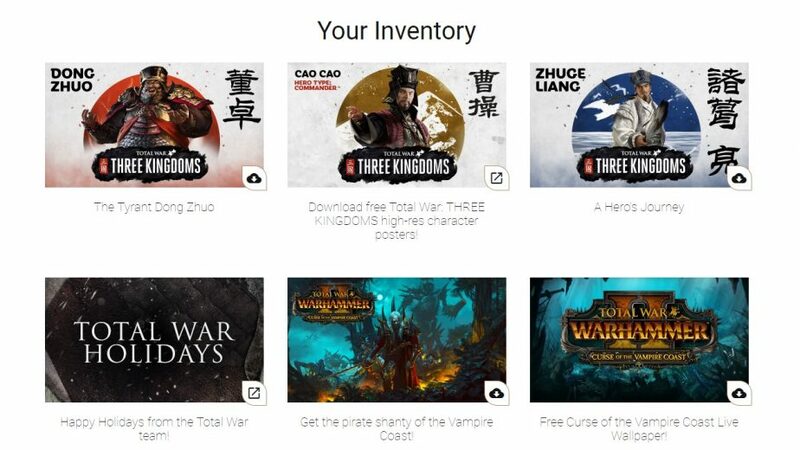 Once you sign in to your Total War Access account, you should see your Inventory, which lists all of the content available for download. You should see ‘The Tyrant Dong Zhuo’ as the most recent entry on the list; “Download the epic choral chant as heard in the Dong Zhuo reveal trailer,” reads the download description. From that entry, you can download the 39.42 MB ZIP file containing the trailer music for free. The post Total War: Three Kingdoms Dong Zhuo Trailer Music Available for Free appeared first on VGR.